Primary Kid's Box is a three-level course designed to meet the requirements of the Polish lower primary segment and the new National Core Curriculum. 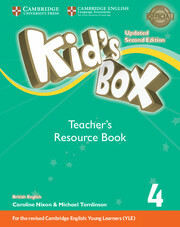 Primary Kid's Box is bursting with ideas to inspire you and your pupils. The Activity Book practices new language and new skills through amusing and stimulating tasks. Trace writing activities enhance writing learning process. CD-ROM provides extra practice of new material as well as extention games to do in class or at home. Thanks to 'My star card' sections pupils monitor their own learning progress.